I have been out of graduate school for all of four weeks, yet I'm back in class. This time, though, it's a e-course, Essential Quilting, taught by Deborah Moebes, the owner of my favorite fabric store in Atlanta, Whipstitch Fabrics. I am excited to be in this class for a few reasons. First, I love learning, and building on skills I already have, and of course, it is nice to have an excuse to get me to the sewing machine every day for the next four weeks. Second, I have decided that I am absolutely buying no new fabric or batting for the projects we are making (a sampler quilt of 12 squares, plus three other projects), since I just moved and am therefore fully aware of how much fabric I already have. Not to mention, I adore all of it, and so that gives me another excuse to use many of these bits, patterns, and motifs again--or for the first time if they were bought for things I never finished or that I bought just because I loved and not for a project. Third, I need a great crash-course in the essentials of quilting. 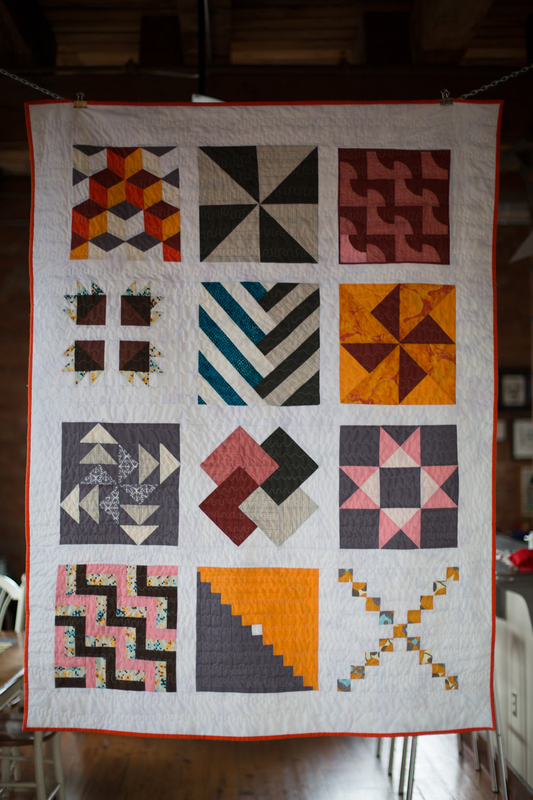 All the quilts I have made thus far (see a few here, here, and here) have been improvisational, except for the Denyse Schmidt Single Girl quilt front I made last fall during another Whipstitch course. I have used photos and other designs as inspiration and created my own patterns; I adore the modern aesthetic and the many talented women creating these graphic pieces of art. But I equate it to jazz music: you have to be really skilled in the basics, the concepts, the essentials of music before you can masterfully take your own course, or fly by the seat of your pants through a song, or a recipe, or a quilt. I am excited to learn a traditional Log Cabin block, a Drunkard's Path, Rail Fence, Card Trick, and the one I'm most excited about, the Tumbling Blocks--which has always scared me enough to keep me far, far away from all those tiny corners to match. But the final, three-dimensional effect is absolutely stunning to me. Maybe, if I can actually get one single square of it done, I'll be brave enough (and crazy enough) to try a whole quilt one day. Or maybe a baby quilt. I'll post my updates, projects, and progress throughout the next four weeks. Excited for a great June!